Metal Gear Is Coming to Life. Again. In Metal Gear Solid IV, Snake has a little robot companion called the Metal Gear Mk. II. And one day, you might have one of your own. But, it might look an ostrich, and it won't be created by Otacon and Sunny. This isn't the first real metal gear. As previously posted, the Cold War had the jump on that. MIT's Dr. Russ Tedrake is currently working on a new robot project that, as website Plastic Pals pointed out, looks a lot like the small Metal Gear, the Mk. II. 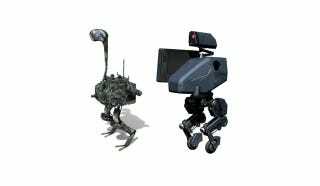 Dubbed FastRunner, the bot is inspired by an ostrich. It should be 4'7" tall, it should weight over 60 pounds, and it could be able to run somewhere between 25 and 50 mph. The robot is part of a Darpa challenge to create robots able to run over 25 mph. Shame researchers can't develop a snaaaaaake.